Note: Graph is based on 20,709 salaries reported for full-time jobs lasting a year or more. A few salaries above $205,000 are excluded from the graph for clarity, but not from the percentage calculations. The left-hand peaks of the graph reflect salaries of $40,000 to $65,000, which collectively accounted for about 51% of reported salaries. 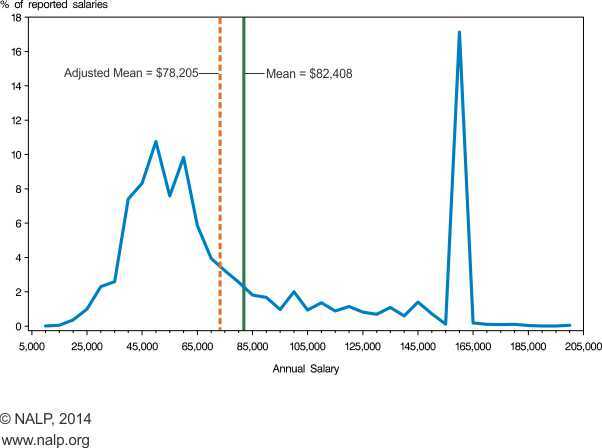 The right-hand peak shows that salaries of $160,000 accounted for about 16% of reported salaries. However, more complete salary coverage for jobs at large law firms heightens this peak and diminishes the left-hand peaks — and shows that the unadjusted mean overstates the average starting salary by about 7%. Nonetheless, as both the arithmetic mean and the adjusted mean show, relatively few salaries are close to either mean. For purposes of this graph, all reported salaries were rounded to the nearest $5,000. Note: The graph above is based on 18,630 salaries reported for full-time jobs lasting a year or more — a few salaries above $200,000 are excluded from the graph for clarity, but not from the percentage calculations. The left-hand peaks of the graph reflect salaries of $40,000 to $65,000, which collectively accounted for about 52% of reported salaries. The right-hand peak shows that salaries of $160,000 accounted for about 14% of reported salaries. However, more complete salary coverage for jobs at large law firms heightens this peak and diminishes the left-hand peaks — and shows that the unadjusted mean overstates the average starting salary by just over 6%. Nonetheless, as both the arithmetic mean and the adjusted mean show, relatively few salaries are close to either mean. For purposes of this graph, all reported salaries were rounded to the nearest $5,000. Note: The graph above is based on 18,398 salaries. A few salaries above $200,000 are excluded for clarity. The left-hand peaks of the graph reflect salaries of $40,000 to $65,000, which collectively accounted for about 48% of reported salaries. 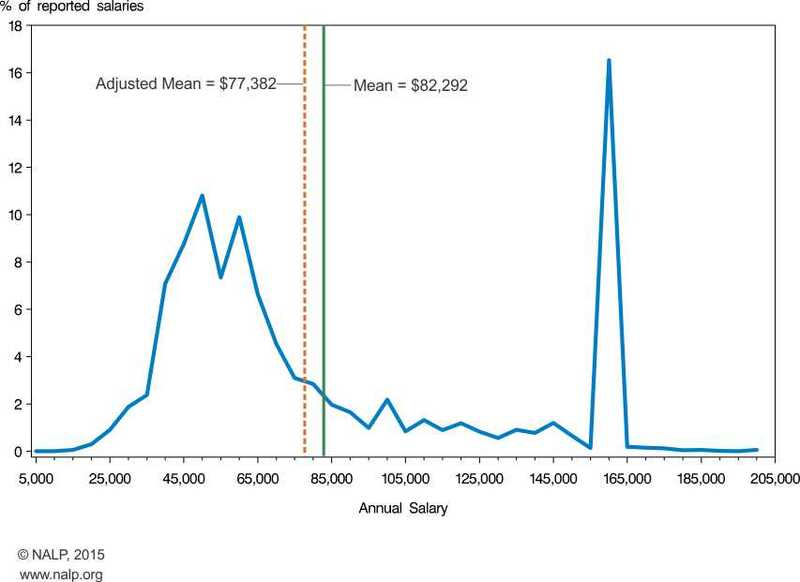 The right-hand peak shows that salaries of $160,000 accounted for about 18% of reported salaries. However, more complete salary coverage for jobs at large law firms heightens this peak and diminishes the left-hand peaks — and shows that the unadjusted mean overstates the average starting salary by about 9%. Nonetheless, as both the arithmetic mean and the adjusted mean show, relatively few salaries are close to either mean figure. For purposes of this graph, all reported salaries were rounded to the nearest $5,000. For more information on the Class of 2008 salary distribution curve, see Starting Salary Distribution for Class of 2008 More Dramatic than Previous Years. Note: Graph is based on 22,305 salaries; a few salaries about $200,000 are excluded for clarity. Collectively, salaries of $40,000 - $65,000 accounted for 42% of reported salaries. For more information on the Class of 2007 salary distribution curve, see Another Picture Worth 1,000 Words. Note: The graph is based on 23,337 salaries. A few salaries above $200,000 are excluded for clarity. For more information on the Class of 2006 salary distribution curve, see A Picture Worth 1,000 Words.